A common concern for public art on display is protection against accidents, even vandalism, and to find a way to make the often valuable artwork safe for maintenance. Seismic safety, especially along the Wasatch Front in Utah, both for the artwork and the public was also a concern on the mind of the curator of the Education in Zion Gallery at Brigham Young University in Provo, Utah, Heather Seferovich. These concerns are important to address whether the art is new or historical. She consulted with Harold B. Lee Library Head of Conservation, Chris McAfee about the best way to proceed. For these purposes, the gallery hired veteran painting conservation expert, Scott M. Haskins (from Fine Art Conservation Laboratories in Santa Barbara, CA) who also provides art conservation services for the History Dept of the LDS Church in Salt Lake City, UT. The two beautiful 18’ murals on the north and south walls of the spacious permanent exhibition area have been one of the most engaging features ever since the Education in Zion Gallery opened in 2008. One mural depicts the Kirtland Temple with a stormy sky (The Temple, A Holy School), while the other features the early Brigham Young Academy building, which is now the Provo City Library (The School, A Temple of Learning). These beautiful murals represent the power of integrating sacred and secular learning and were painted specifically for this location and purpose. 10 years of grime were carefully removed from the murals before they were hand varnished (for the first time). The varnish quality chosen was conservation grade and based on Standards of Practice of the American Institute for Conservation of Historic and Artistic Works, the national professional art conservation organization – the AIC. Two paintings on display were also cleaned and varnished and went through a significant transformation. Mr. Haskins was assisted in the work by students from the Harold B. Lee Library conservation lab. They were able to clean parts of the murals and they also cleaned and waxed the frames. BYU Physical Facilities built the scaffolding in front of each of the two murals and helped remove the frames. Seferovich, the curator of the Gallery conscientiously reviewed the measures taken to make all the artwork, including sculptures, safe if there were to be seismic activity. Of course, “safe” means not only for the artwork but also to make sure that the public is safe in the event that objects on display move. To their credit, Facilities also took the proactive actions to double check the seismic safety of the attachment of the murals to the walls and for the frame attachments around the two murals. They will not be coming off the wall with the next “big one” which is a comforting thought. 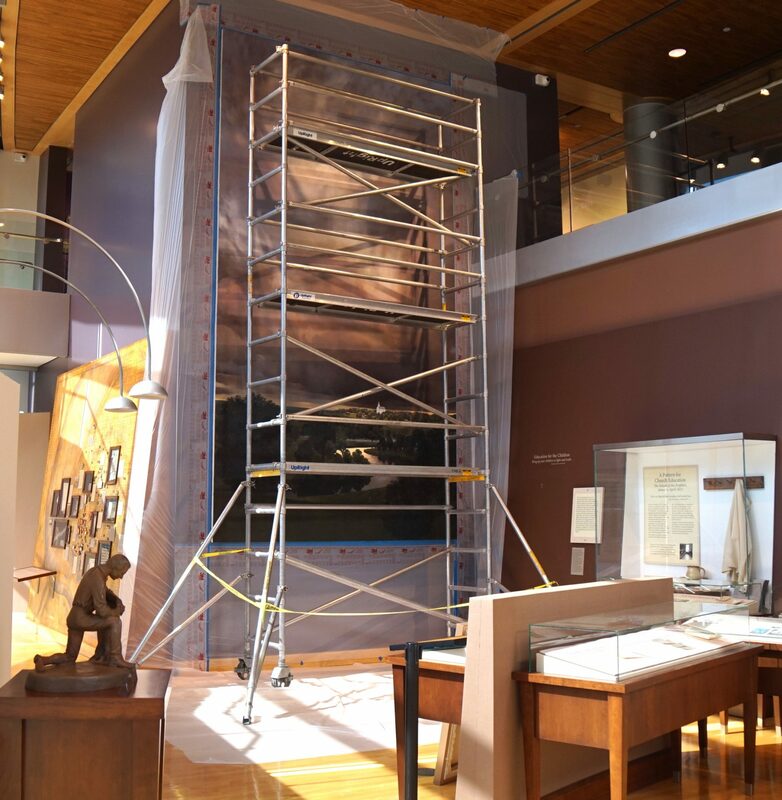 Be sure to visit the Education in Zion Gallery soon to see the finished conservation work on these stunning works of art, which symbolize the aims and mission of BYU. The gallery is grateful for Scott M. Haskins’ expertise in helping to conserve these murals. This entry was posted in Disaster/Emergency Response, Murals and tagged mural protection, Public art. Bookmark the permalink.